• Ovis canadensis has a MOVE of 2. The species originated in Siberia, and crossed over to North America via the Bering land bridge. 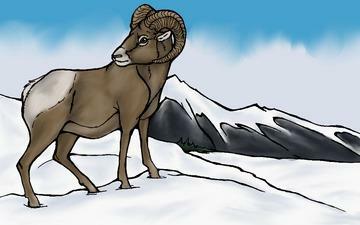 Bighorn sheep (Ovis canadensis) is a species of sheep in North America with large horns. The horns can weigh up to 30 pounds (14 kg), while the sheep themselves weigh up to 300 pounds (140 kg). Recent genetic testing indicates that there are three distinct subspecies of Ovis canadensis, one of which is endangered: Ovis canadensis sierrae. The bighorn sheep originally crossed over the Bering land bridge from Siberia: the population in North America peaked in the millions, and the bighorn sheep entered into the mythology of Native Americans. However, by 1900 the population had crashed to several thousand. Conservation efforts (in part, by the Boy Scouts) have restored the population. Bighorn Sheep live only in remote, treeless mountain terrain. They use steep slopes and cliffs to escape from wolves, coyotes, and cougars. Many migrate seasonally, some moving a few hundred meters up or down a mountainside and others going 10-20 km from one mountain range to another. Some males make much longer migrations. Males and females live apart except during the mating season, when males vie for access to females. Larger size and age usually confer an advantage. The males rear up on their hind legs, kicking with their front legs and clashing their horns. Although Bighorn Sheep have heavily buttressed heads that absorb the shock of butting, these battles can result in death. Ewes usually give birth to one lamb, in May; twins are extremely rare. The lambs can follow their mothers within a day after birth, and nurse for 4-5 months. Bighorns eat seasonally available grasses and other vegetation, and cactus in the desert. They are attracted to natural salt licks, cattle licks, and piles of salt placed along highways for melting snow. In some places where bighorn populations went extinct, groups have been reintroduced, but many parts of their original range are no longer suitable. The species is declining in desert areas.